Goodreads Summary: When it comes to relationships, Remy doesn't mess around. After all, she's learned all there is to know from her mother, who's currently working on husband number five. But there's something about Dexter that seems to defy all of Remy's rules. He certainly doesn't seem like Mr. Right. For some reason, however, Remy just can't seem to shake him. Could it be that Remy's starting to understand what those love songs are all about? I've read other books by Sarah Dessen, but this one has been on my to-read list for a long time. I'd heard that it was one of people's favorite Sarah Dessen books, so I had high hopes for it. However, this book wasn't quite was I was expecting. Remy is a character with a lot of issues. Her mother's relationship troubles have definitely made her cynical about love. All she really knows of her father is that he wrote "This Lullaby" for her, in which he admits that he'll always let her down. Thankfully Remy has a close group of friends - Jess, Lissa, and Chloe - and together the four of them can face anything. In fact, even though this was supposed to be Remy and Dexter's story, I loved the interactions among the four friends more than anything else. They had just the right mix of humor, insight, and support. As for Dexter, to me he seems like one of those guys - the kind that annoys you at first, but after a while you can't help but come to like him. He's not a "dream guy" by any means, but he still has his own appeal. He and Remy certainly prove to be good for each other. Despite the fact that I enjoyed the characters of this book, I did have an issue with it: things often seemed stagnant. I felt like certain scenes got bogged down with unnecessary descriptions, which really affected the pace. Although I enjoy introspective books, and even though I could identify with Remy, the internal conflict wasn't quite compelling enough for this book to completely draw me in. 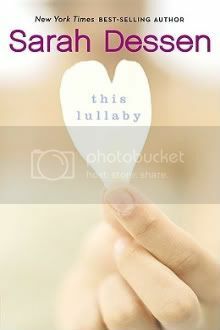 Even though This Lullaby wasn't everything I hoped for, it certainly had good moments. There are still other Sarah Dessen books that I want to read, and I look forward to seeing what those stories hold!